Hello lovelies, how are you doing? Hope you all had fun during this bank holiday week end. I relaxed at home, had a couple of pic nic in the park, where, as always, I had to apologise to few people because of my very unpolite adorable dog, that was going around stealing food from the barbeque's around. 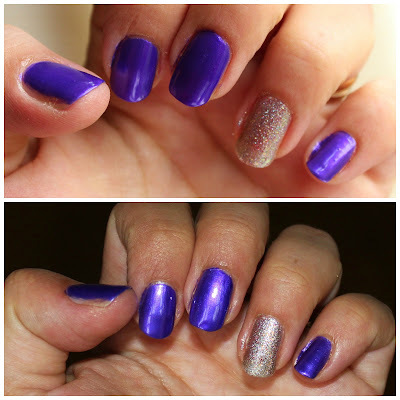 In today’s post I wanna show you how I did my nails yesterday and talk about this nail polish from Sinful Colors. ...that akward moment you realize you did an horrible job on applying your nail polish.. This American brand has landed few months ago in Boots and I couldn’t be happier. I bought this in Chicago last year (Gosh has been a year...can someone bring me back there?) for few dollars and I was impressed with the pay off and the quality overall, considering the price. This shade is number 929 “Let’s talk” and is a deep metallic purple. With a base and a top coat I usually get a good 3 days without any chipping visible. 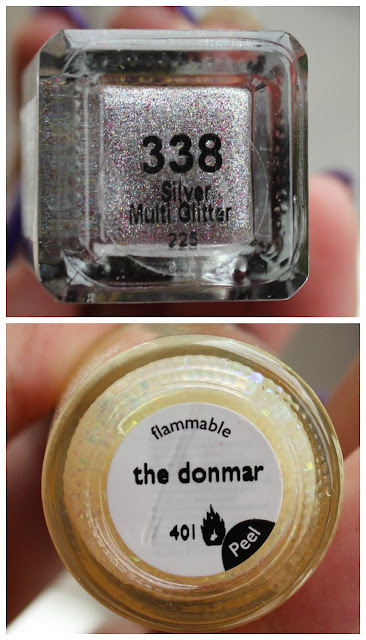 If you are a nail polishes lover I suggest you to give this brand a go, they are priced £2 with an impressive variety of shade and you will find few interesting dupes of more prestigious brands. On my ring finger I applied Barry M 338 “Silver multi glitter” and Nails inc. Special Effects 401 “the donmar. I used two different kind of glittery polishes because I wanted to get an holographic effects and I found that using two different dimension of glitters usually works that way. this brand is absolutely amazing, cannot believe such a good price for all those shades!